@Raymond, Yes there is an option in the PDF Stamper that will allow you to manually stamp a PDF file. You can specify the information you want stamped. Can I manually stamp a PDF File with specific information for a client. For an example can I stamp a contact with the clients information? I just wanted to say thanks for making this easy to use with ClickBank. @Gustavo, When using the eStore, eMember and PDF Stamper you have the following options. Hi! Can I use this plugin without a purchase form? I have a closed site with a lot of PDFs and only logged members can see them. With this plugin, can I capture the infos of those logged in users and stamp the PDFs once they try to download them? @Yury, All of our plugins are designed to work out of the box without code modifications. Do I need to make code modifications to use this plugin on my WordPress site or does it work out of the box? @Phil, For stamping a file with member information you would also need the eStore and the eMember. You can then offer a free download with the members details stamped in it. I want be able to use your product so that when a user goes to their account settings they have the option of downloading a file that will be stamped on the fly using your product – is this something that can happen if I purchase? My pdf is an add-on to their subscription service, but I’d still like to secure it. Happy to consider alternatives solutions? @James, Yes this can be done. The PDF Stamper will display the customer name and email address for stamped files in the “manage stamped files” section of the admin. When a file is stamped I need to be able to see the customers name in the manage files section of the Admin, can this be done with the PDF Stamper? I already have implemented a different membership plugin (s2Member). I provide digital content of my magazine online to the paid subscribers. I like to add a “download PDF” option for offline viewing of my magazine to my paid subscribers. So, I like this plugin to stamp an issue of the magazine PDF that is already on the server with the subscriber’s information for offline downloading. So, can PDF Stamper plugin simply verify that the user is logged in and a paid subscriber and just stamp the requested PDF, or does it require the payment process with every PDF stamping? If it doesn’t support this, do you think it’s easy for an intermediate PHP developer to modify your code to implement this feature? 1. Yes you can use only the email password protection feature with the customer’s email address. 2. You can only specify what page to start on. Example: You can have the stamping start of the 10th page of the PDF. It will then stamp the 10th page till the end of the PDF file. Note you will need to use the eStore, eMember and PDF Stamper for the above option. 1. Is there a way to use ONLY the Password-protected feature with the customer´s email? 2. Is there a way to have the footer ONLY in the first and last page? 3. Is there a way to use the plugin in a membership site page, where customers can download the PDF? I mean: I have a Membership site where all customers can access different pages of content and they can download pdf´s. I would like to use this in that situation, but don´t know how the plugin could then identify what customer is downloading… Through IP maybe? 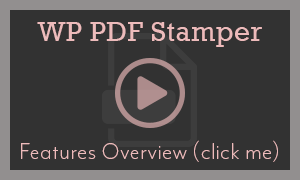 This WordPress PDF Stamper just might what I need! I have to offer a zipped products (multi files) because eStore will only accept one file per product. Will the Stamper stamp each PDF in that zip file. If not, how do I use stamper to stamp multiple pdfs in my products and use eStore too? Nice Plugin, great! I will buy it as soon as i need it. Im not finished with my ebook right now but time will fix this. @French Marketer, my reply from the thread just above your comment should answer your question. I’m using a custom shopping cart solution. How would I get the plugin to stamp files for my customers ? Do I create a new WordPress blog, and then send my customers to a “register” page ? Then where will they get to download the stamped file ? @MacMyDay, The PDF Stamper has an API that can be used to integrate with any shopping cart plugin. The integration needs to be done by the shopping cart developer. We are always open to help with the integration but the developer has to be interested in the first place. 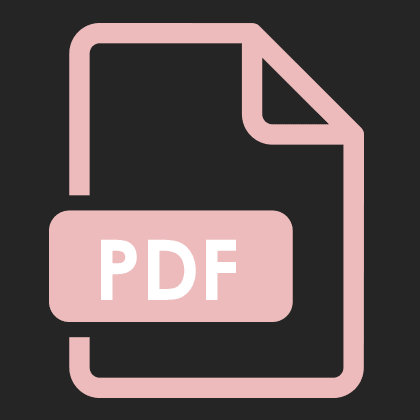 Can this pdf stamper be used with other commerce plugins such as Shopp, eShop or Cart66? The way manual checkout works is that you send the product manually after your receive the money. You can’t have the same level of automation like you get with PayPal when using the manual checkout. This is because the plugin has no way of verifying that the customer gave you the money when you use manual checkout process. So when using manual checkout you can’t have the same flow like the instant payment options (example: PayPal). You will have to manually stamp the file (using the manual stamping menu of the plugin) after you receive the money and then send it to the customer. If I understand this correct, the customer will receive without any payment just after checkout. If I want to do this like you also prefer, to send the Link after receiving the payment, how can I send automatically downloadlink to the stamped and password protechted (with PW = Mailaddress) Files to the Customers. If you check that option it will automatically stamp the PDF file and send it to the customer when he submits the manual checkout form. Yes, exactly. Sorry for my bad explanation, I am from Germany. @Thomas, what do you mean by the 2nd payment gateway? Is it the “Manual Payment” option of eStore? I use PDF Stamper and WP eStore. I offer a second payment gateway, in this case I have to wait for the payment before the customer can receive the stamped ebook via a download link. So I disabled the option that the customer receive the download link. Do I have to stamp manually after I received the money? Ho can I do this automatically? Otherwise I have to stamp, save this PDF and send the PDF as an attachmend to the customer. Is there any possibility to get this easier done? Thanks for you help. Can Pdf stamper stamp date of purchase or does it already do this automatically because that would be great if it did? Hi, Yes it works with the current version of WordPress and PayPal the instructions are the same. I am just about to launch my site for my ebook, and I was wondering if the stamper works with WordPress 3.1.3, since the instruction videos seem to be for older versions of WordPress and PayPal? And so if it does work with current versions, how I do get the instruction videos for them? Thank you for your help and time. Hi Karin, the answer will vary depending on what kind of integration you have in place. I am going to make a guess here… I am guessing you are using the PDF stamper with Plain PayPal button. If my guess is correct then please open the “wp-pdf-stamper/api/ipn_customization_config.php” file and you will be able to customize the email that gets sent out to your customer including the “From Email Address”. Hi there, great application! Just wanted to know how to change the email that includes the download link? I would like it to be FROM my business instead of WordPress. And I would also like to modify the actual email, so I can inform customers to use their email address as the password in order to open the link (as I have selected this security option in the settings, but it is not mentioned in the email text). Can you please help me? Thanks a lot! I just got to say that you have developed an awesome plugin here! I’ve been looking for a reliable and affordable software like this for years. Just bought an hour ago and I’m already rocking and rolling… this is gonna be awesome!!! Thanks so much dude! Perfect! I was just thinking about how to help my mom sell her book on crochet and recipes. This plugin will definitely be useful. @Nick, The PDF stamper does not do this but it won’t hard to add. All it needs to do is look up the details of the currently logged in user’s data and stamp the PDF file with those data. A WordPress shortcode that lets a logged in user download a stamped copy of a PDF file will do. The squeeze form created by eStore can sign up the customer to AWeber and then send them a stamped copy of the PDF file to their email address. I’d like to get people to sign up on my website to my mailing list via Aweber and then take them to a page on my site where they can download a stamped pdf. Can this be done with WP pdf stamper? Thanks. Wow awesome plugin guys, can it stamp PDF’s without a transaction taking place? EG: A visitor comes and opts in to get my PDF and I want it to be stamped with his personalised info same as before just without them having to make a purchase. All fixed. Thanks so much for your help and great service Ivy! @Melinda, I am guessing you are using eStore for the packaged product option? If you are then yes PDF stamper will stamp all the PDF files in a package but since you have a mixture of PDF files and zip files it may be getting confused. Can you please create another test package product with only the PDF files then test it to see how that works? I’ve got a product with a multiple file download, 3 are zip files and 3 are pdf files. The PDF Stamper doesn’t seem to be working when there are multiple files – it’s working fine when it’s only one file. Is there a way to set it up so it will stamp the pdf files even in a bundled product? Hi D.K., The original PDF will need to be unsecured for stamping. With that said you can set different security options in the stamper that will be added to the stamped PDF file. Can the PDF be secured so that it can only be printed? That is, no content copying or page extraction? Hi, All of our plugins work with the latest version of WordPress.